Now you already know some decorative cast ons. 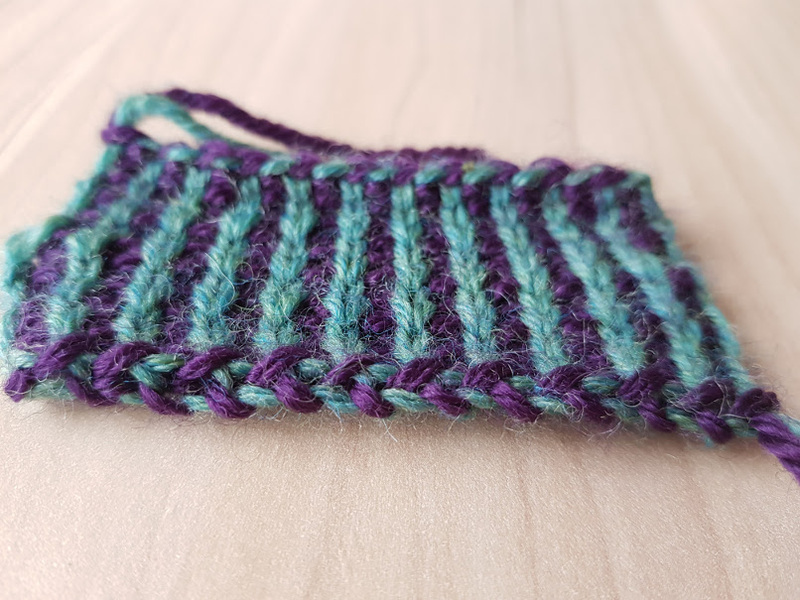 But what if you are knitting mosaic stitch pattern? Or a beautiful fair isle sweater? Or any other kind of colorful project? One of those decorative edges may seem a bit too much and a plain cast on too dull. Instead, you can use a cast on that is quite simple in shape but uses the same colors you are already using in your project. 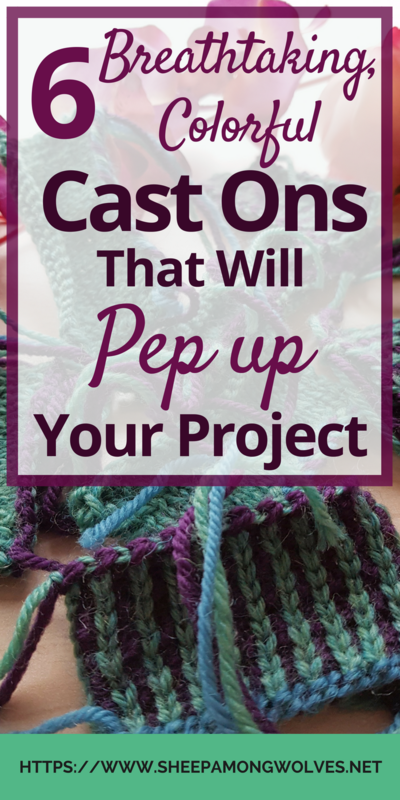 Here, I have six colorful cast ons for you to try out. For some reason, it’s difficult to find videos for these cast ons. So please read the description and watch the videos for the Two Color Braided Cast On and the Tricolor Corded Cast On to figure out how to do a Two Color Corded or a Tricolor Braided Cast On). If you want me to provide videos for you, please let me know. I will try to do so. These are two separate cast ons, but they are almost identical when you work them. They are both Longtail Cast Ons. You form the decorative edge by twisting the two strands of yarn around each other after every stitch. You start with a slipknot for both, but it doesn’t count as a stitch, and you drop later. Then you place one strand around your thumb and the other around your index finger as you would for any longtail cast on. 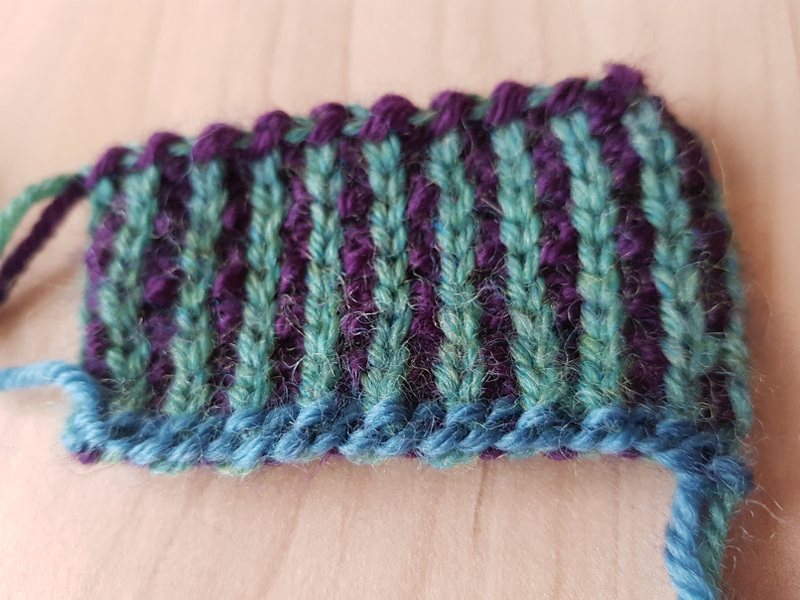 For the Braided Cast On, you move the strand from your thumb over the yarn from your index finger and switch their positions. For the Corded Cast On you move the strand from your thumb under the strand from your index finger when changing their positions. These cast ons are very easy to do and as flexible as the Longtail Cast On. This makes them quite versatile. 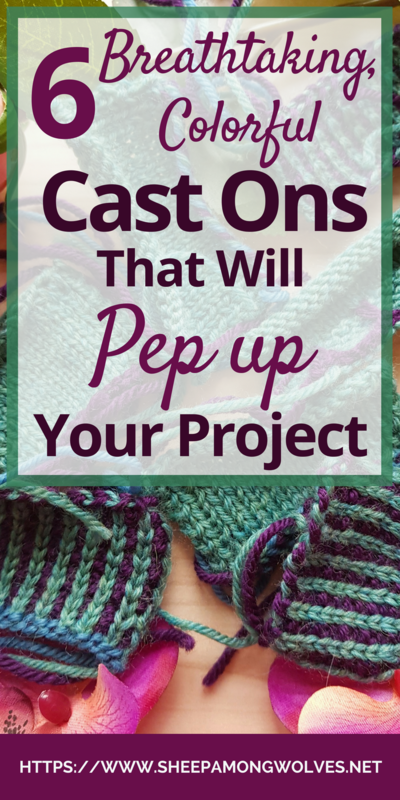 You can use them for almost any project (maybe not the neckline of a baby sweater). The effect they create is quite beautiful, and they set up the stitches nicely for corrugated ribbing or double knitting (the stitches alternate color). I use the Braided Cast On for all of my double knitting projects. They look great on any colorwork project or as a nice contrast and splash of color when followed by plain-colored knitting. These two cast ons are worked almost the same as their two colored counterparts. However here you keep twisting three strands of yarn. Two are always on your fingers, and one hangs down loosely. Two make it easier I usually hold the yarn that is not currently in use in my right hand (together with the needle). Doing this made it easier for me when I had to twist them. Otherwise, I would always have to check to see if I kept them in the correct order. Here is a video on how to do the Corded Cast On. Again these cast ons are just as stretchy as the Longtail Cast On, and you can use them in a variety of projects. You can do this type of cast on with even more strands if you wish. But I wouldn’t advise using more than four or five strands. It becomes too confusing with so many strands and the floats that form the decorative edge would become longer and eventually be impractical and might snag. You can use the Twined Cast On with one color but also with two or three. It is a variant of the Old Norwegian Cast On. It is similar to the Longtail Cast On and about as elastic as well. And this makes it another nicely versatile cast on. If you use it with one color, it doesn’t stand out as much but is still a beautiful cast on and a lovely detail on any project. When worked with two colors the second color is only visible on the edge itself and can be a nice contrast even on a plain-colored project. 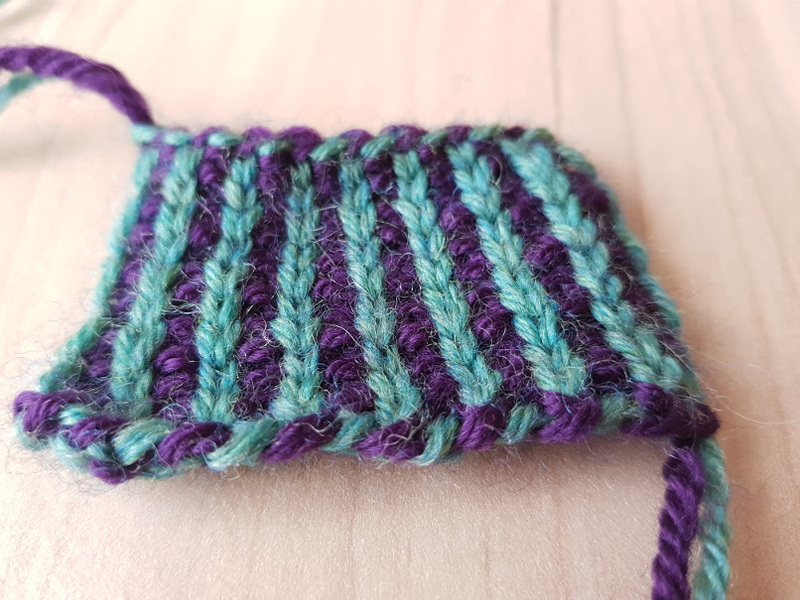 If you work it in three colors, it’s an excellent setup for corrugated ribbing because the stitches will alternate between two colors. 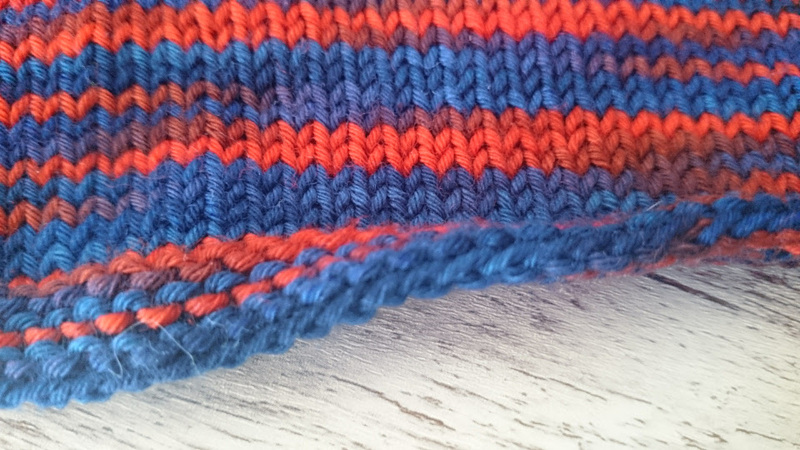 The yarn placed around your thumb will only stay at the very bottom of the cast on edge. For an especially nice effect use a yarn with a high contrast to the other two. That makes the decorative stand out. Say that three times fast! I found this cast on quite by accident while browsing on Pinterest. Technically this is not a cast on using several colors. You need a multiple 6 stitches +1, but you can easily modify it to multiples of 5+1, 4+1 or similar. You cast on in your contrast color in any way you like. Then you drop your contrast color and knit with your main color. You knit 3 and slip 1 with the yarn held to the wrong side and then knit 5 and slip 1 until 3 stitches remain and knit the last three. (Take note: There is an error in the instructions. It’s not k6, sl1 but k5, sl1, otherwise you would have needed a multiple of 7 stitches +1). You continue this for 7 more rounds (4 garter ridges) and then work regularly with your main yarn. 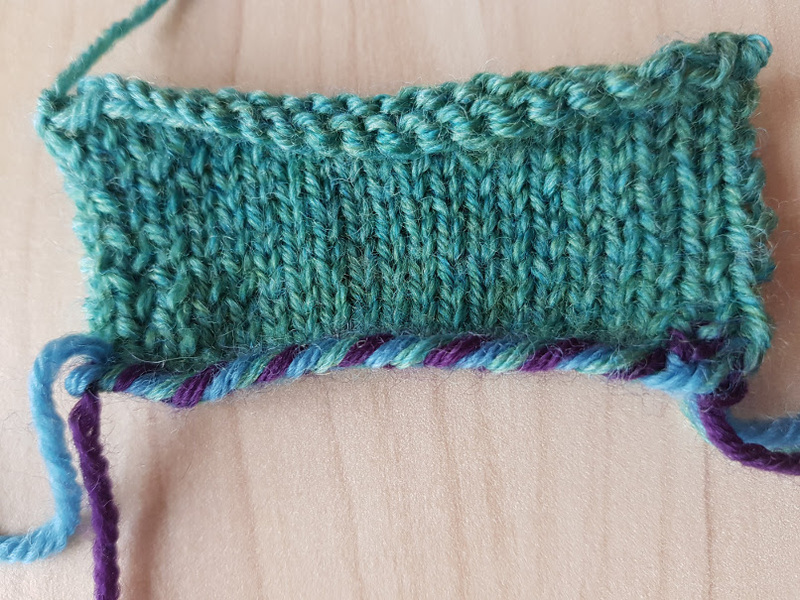 As the author states: You may need to switch to needles one size smaller if you continue in stockinette or garter. Or decrease one stitch for about every 12 stitches. I decreased two of my 31 stitches and did not get any flare. The edge does like to roll up a bit though. 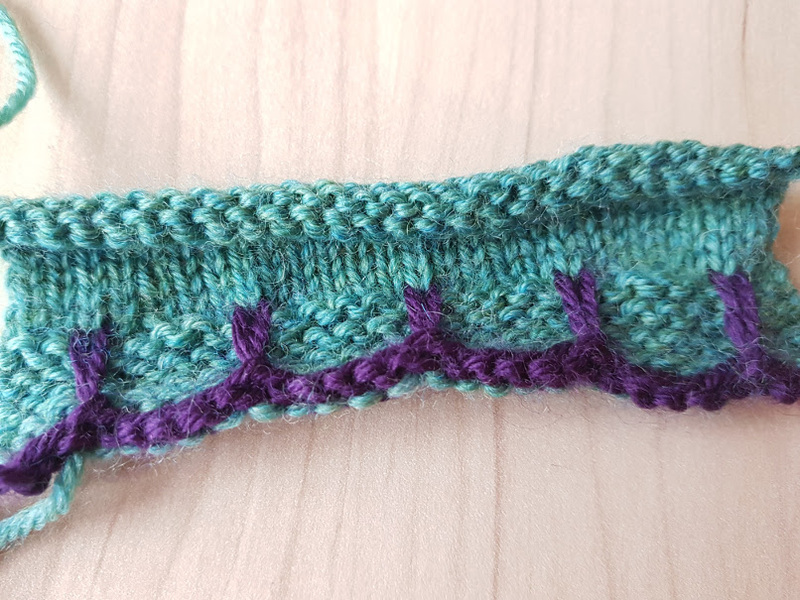 You might be able to avoid that by knitting only 6 rows total of the slip stitch pattern or by using larger needles to cast on (so there is more yarn to pull up into the elongated slip stitch). 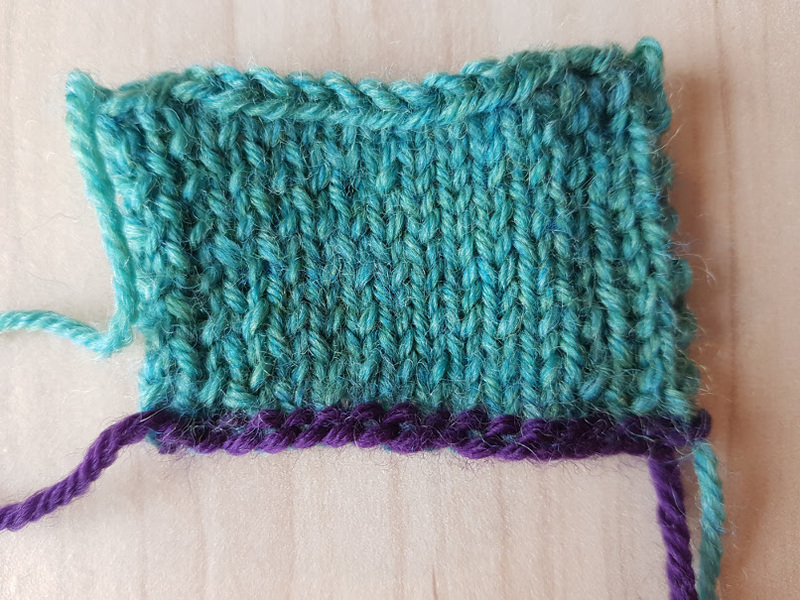 Two things to look out for: Always slip the stitch with the yarn held on the wrong side of the work (that means it switches every round). And if you use the Longtail Cast On (like I did) your first row will be a wrong side row. So you will have to purl every row for the garter stitch. Which multicolored cast on was your favorite? Have you already used one of them? Do you know any more? Please let know in the comments below. 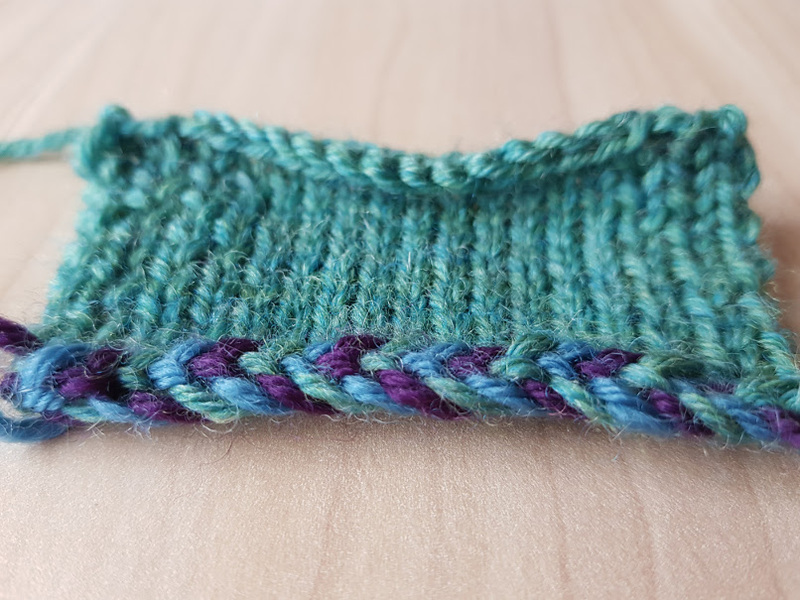 Next week on this very blog: The first part of my beginners’ knitting needle guide. Along with links to my personal favorites right now. Observant readers may already know which ones they are because they keep showing up on photos.